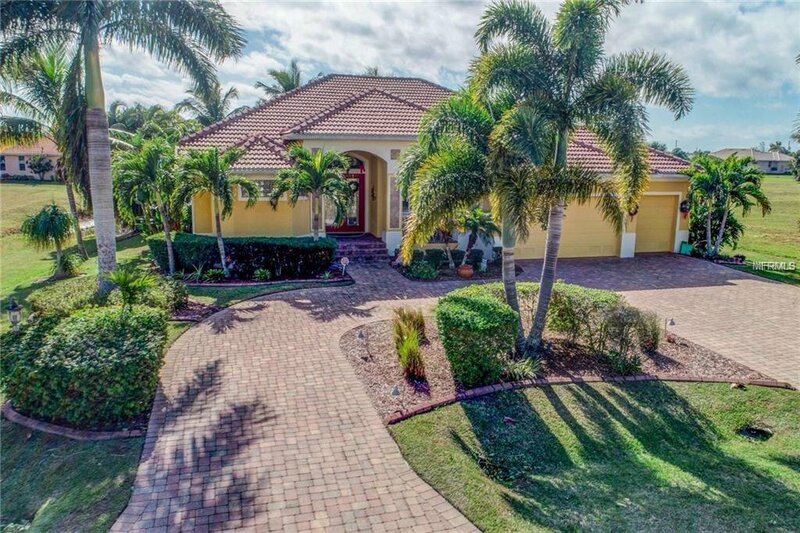 YOU MUST SEE this stunning home in Punta Gorda Isle's Burnt Store Lakes! As you approach its circular drive way, you will notice the spacious three car garage and beautiful landscape. Upon entering the home you will see customized features and upgrades throughout. This well maintained magnificent home was built to wow you with an open concept, high ceilings, custom built shelving and entertainment center in the living room and much, much more! The kitchen has custom built cabinets and a matching over-sized French door Thermador refrigerator and dishwasher. The home has a premium appliance package including a 35 lbs standalone ice maker and wine fridge. All bedrooms and the study/den have custom bamboo wood flooring, with tile in all other living areas. The master bedroom is spacious and has double tray ceilings; two custom built walk-in California closets; the master bath has dual vanities, granite counters, a custom bath tub and walk-in shower. Another bonus: included in the sale is the living room, dining room and bonus room furniture, as well as the patio furniture. There's more: the garage also has custom cabinets for extra storage; the screened pool and hot tub are heated by solar & propane; manicured landscaping surrounds the home and provides privacy while you are enjoying the pool or sun bathing, included are Coconut palms, fan palms and eureka palms. CALL TODAY!!! THIS IS TRULY YOUR DREAM HOME. Listing courtesy of XTREME REALTY TEAM GULF COAST. Selling Office: WALKER REALTY GROUP FLORIDA.